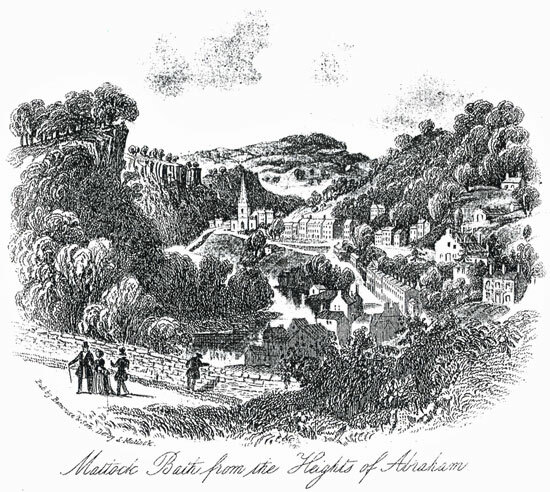 The high-road at MATLOCK-BATH, along which stand terraces of handsome houses, detached villas, hotels, museums and shops, runs through verdant vistas, along the western side of the river Derwent, meandering in its fertilizing course through delightful valleys, and bounded by undulating hills, whose sides are richly clothed with woods, and studded with "modest mansions," more ambitious residences and rural cots, which rising ridge over ridge to the craggy heights, command a succession of prospects, whose varying beauty never fails to be appreciated with admiring delight. A ramble by the serpentine walks, which gradually lead up the ascent from the Museum Parade to the "Heights of Abraham" (denoted by a tower on their summit, not only discloses the diversified views of the landscape, but conducts the visitor to the RUTLAND CAVERN, one of the most remarkable curiosities, which have given a more than national celebrity to the district. These caverns are, for the most part, excavated mines, which have been worked, from age to age, by successive generations from the olden time, when those mighty masters of the world, the ancient Romans, left the memorials of their power and skill in Britain - till their subterranean chambers ceased to yield a remuneration for the toil of the exploring labourers. p.12 RUTLAND CAVERN - DEVONSHIRE CAVERN. The citizen, and brace his languid frame! " of stone, 200 feet long, and 40 broad, flat and regular as the ceiling of a room, excites admiration; in another, a fearful cavity, a kind of Wolf's Glen scene, where the witches in Macbeth might appropriately ply their horrid "deed without a name," attracted our notice; and an involuntary exclamation of astonishment and delight burst from our party, as, our candles being extinguished, a Bengal Light, ingeniously placed on the summit of a colossal pillar of rock, fantastically, though not inaptly called the Druid's Altar, suddenly threw its vivid glare around the cave, illuminating its dreary recesses in an almost supernatural manner, and reminding us of the spectral superstitions which the lovers of romance so often describe. On leaving this cavern, we pass, by a delightful path along ; the Heights, from which many varied and splendid landscapes may be viewed, to the DUNGEON TORS, or ROMANTIC ROCKS: which are situated near the top of the wood behind the Old Bath. There is a lofty hill or precipice, covered with wood, and beneath it a vast mass of limestone, having a perpendicular face, in some parts fifty or sixty feet high. This face may be considered as divided into two portions, running in different directions, in such a manner, that they would form nearly a right angle at their junction, were there not in that part a projection of the rock, causing it to form two angles instead of one. From these angles, in one of which is the mouth of a mine, several very large fragments have separated; and what is very remarkable, they remain in an erect posture, some of them rising to a great height, and consisting of several enormous stones, piled one upon another, in the regular manner of masonwork. The passage betwixt these detached cliffs and the parent rock, if it may be so termed, varies in breadth from four to ten or twelve feet, and is about thirty yards in length. p.14 SPEEDWELL MINE AND CUMBERLAND CAVERN. It is decorated on each side with moss, yew, and pendant ivy, and the gloominess of it is much deepened by the numerous trees that grow on the steep hill above, and hang over it; the whole forming a romantic group, not easy to be described. * The ground adjoining these rocks is overspread with a multitude of stones of large size, covered with moss and wild plants; and amidst them are numerous tall ashes and elms, some of them invested with a mantle of ivy to their very summits. In short, there is not anything near Matlock that more deserves inspection than these most remarkable rocks; nor are they less worthy of attention than Chee Tor, the High Tor, or any other of those Tors, in the delineation of which Derbyshire tourists dwell with so much apparent satisfaction. Through these Romantic Rocks is the entrance to the NEW SPEEDWELL MINE in the Upper Wood, which is in many respects one of the most interesting and beautiful of the Matlock Caverns; all of which are capable of being easily and comfortably explored, under the direction of the guides resident in their vicinity. Leaving the locality of these caverns by a gentle and picturesque declivity, which leads down to the high-road through the dale, the path discloses a succession of charming landscapes of surpassing interest and beauty. * Much of the timber has recently been felled.  Geological Descriptions of the Caverns are given in an Appendix. p.15 MUSEUM PARADE-CHURCH AT MATLOCK-BATH. The MUSEUM PARADE is a pleasant and cheerful promenade, in which are situated the principal shops and places of business; prominent among which are the museums, the proprietors of which have on sale most interesting and beautiful collections of natural curiosities, and every variety of Derbyshire Spars, worked up with admirable taste and skill, into articles of personal and domestic use and ornament. An hour or two spent in these establishments, will not only gratify the feeling which induced the poet to exclaim -"A thing of beauty is a joy for ever," but will inform the mind, by making it familiar with the geological peculiarities of the district, and its remarkable productions; these Museums forming, as it were, a series of illustrations to the book of knowledge, which Nature here expands for the consideration of intelligent inquirers. The general appearance of the Bath has during the few last years been greatly improved by the erection of villas and other houses and shops. A Branch Bank has been opened by the Derby and Derbyshire Banking Co., and a handsome new Wesleyan Chapel has been built, in Derwent Terrace. £2,260, in the decorated style of Gothic architecture ; cruciform in shape, with a tower and crocketed spire at the west end, 129 feet high. The chancel window of five lights, has some good tracery, elegantly filled with stained glass, and is rich and handsome. The length of the interior, from west to east, is 95 feet, and the breadth 27 feet 3 inches ; the transepts from north to south are 53 feet, and the width 21 feet. At the time of its erection, it was thought an excellent specimen of its kind; but the advances lately made in ecclesiastical architecture and other arrangements for divine worship, will readily suggest several points for improvement to critical minds; although, as a convenient and handsome "house of prayer," it must be dear to all, whether residents or tourists, who value the ministrations of the Church.